As a child of the 80s/90s, I grew up watching Home Alone. I would always imagine setting up traps inside of my house if bad guys ever tried to get in. Haha! If you aren’t familiar with the film, you must go watch it! It’s a Christmas classic! 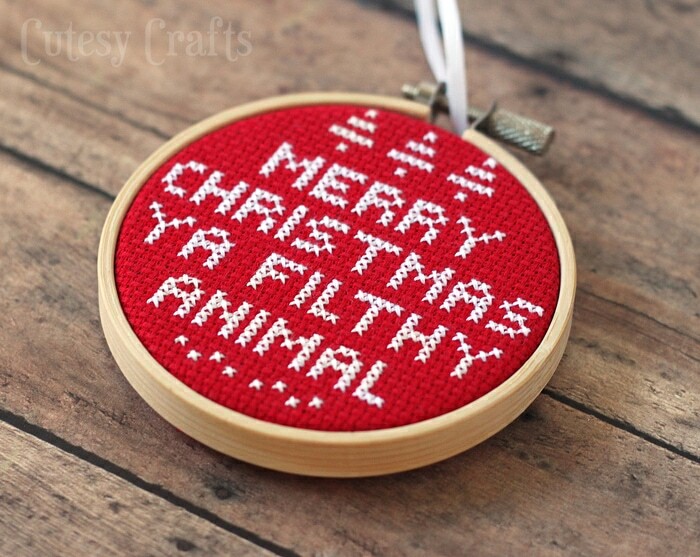 This cross stitch ornament definitely brings back some serious nostalgia and makes me laugh. 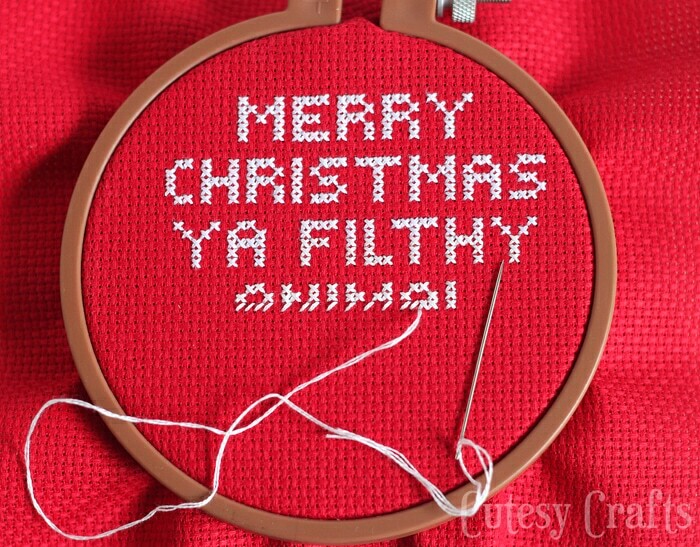 It would make a great gift for someone who likes Home Alone, and it’s really easy to whip up if you like to cross stitch. 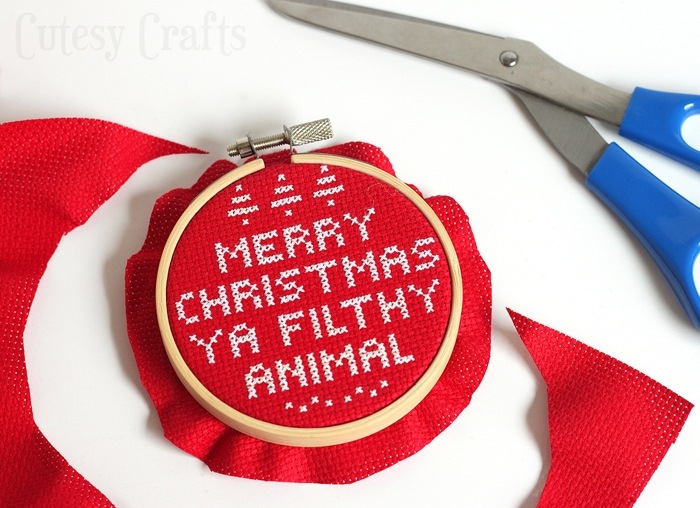 Put your Aida cloth in an embroidery hoop that is slightly larger than the one you got for the ornament. Cross stitch the pattern using two strands of embroidery floss. When you cross stitch, it’s best to do the stitches in rows. Start on the left side of the row and make half of the “X”. When you finish that row, go the opposite direction and make the other half of the “X”. Start with the top row and move down. 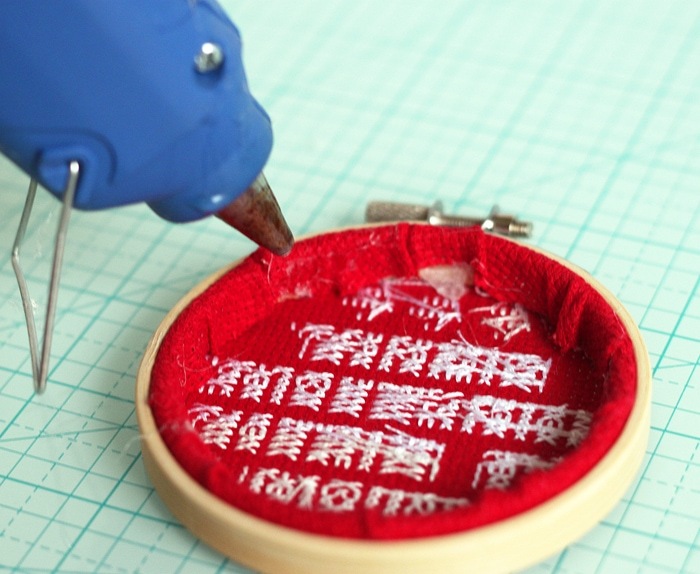 If you’ve never cross stitched before, there are plenty of tutorials out there to show you how. Center the design inside your small embroidery hoop and trim off some of the excess fabric. Tighten the screw on top to make sure everything stays in place. 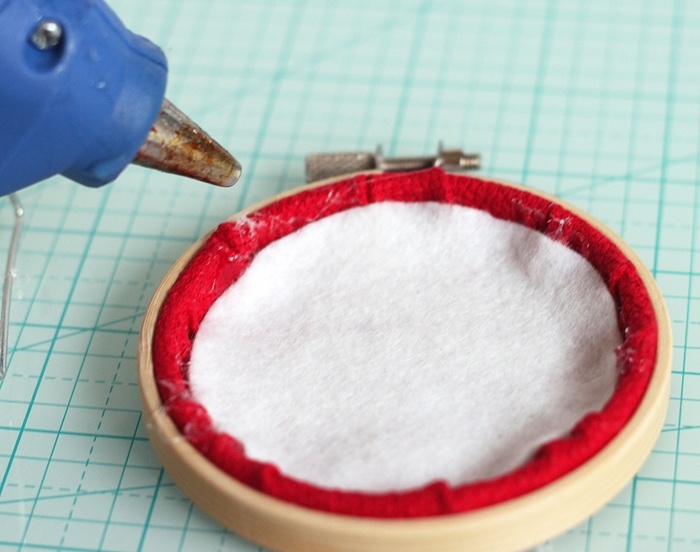 Fold over the extra edge of the cloth and hot glue it to the inside of the embroidery hoop. 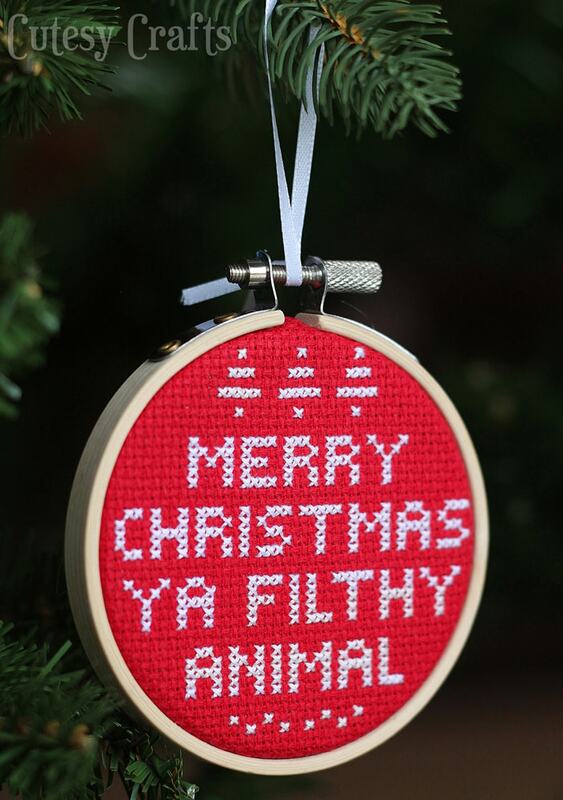 Make sure the glue stays on the hoop so it doesn’t seep through to the front of your ornament. Cut a circle of felt slightly larger than the inside of your embroidery hoop and hot glue it to the back. Again, make sure to keep the glue from seeping through to the front of the ornament. 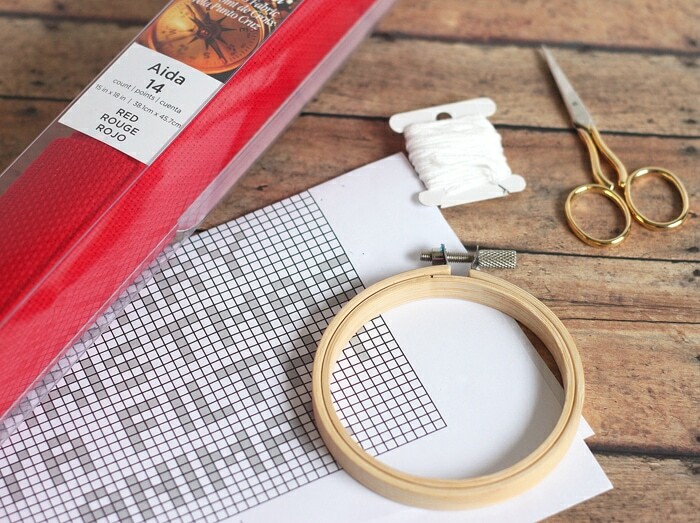 Tie a piece of ribbon to the top of the embroidery hoop, and you’re done! 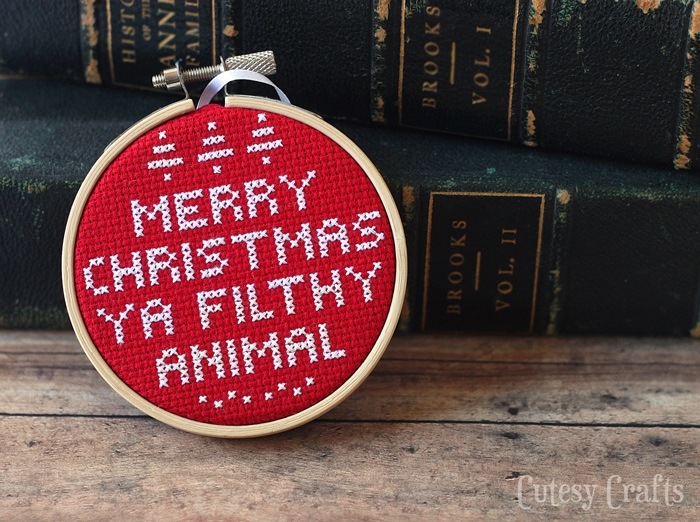 Did you grow up watching Home Alone too? What’s your favorite part of the movie?